by Haley Goetz If I had to sum up The Wave in one word, it would be “formulaic.” I walked into the cinema with relatively high expectations, for I’d never heard of a disaster film being “critically acclaimed” at the Toronto International Film Festival, a prestigious worldwide proving ground for artists of the moving image. I was let down, however, when I realized that the only thing setting this film apart from, say, San Andreas, was the fact that it actually had decent cinematography. It also took place in a gorgeous Norwegian fjord rather than in a mishmash of Los Angeles strip malls. 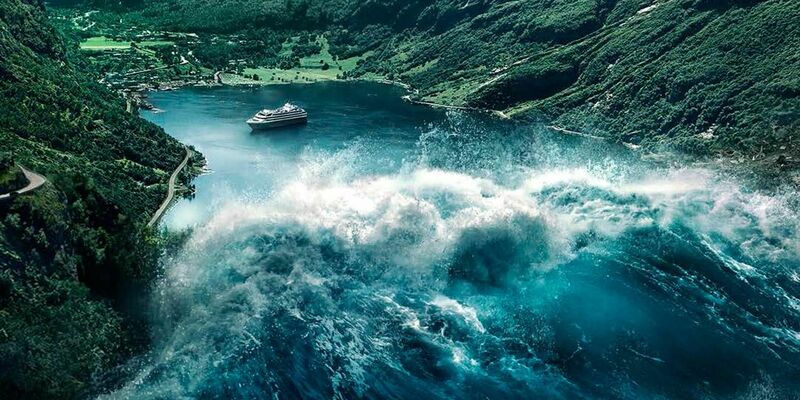 The Wave centers on a family that lives in a small tourist town located at the head of the Geiranger Fjord, a vast sea inlet bordered on all sides by jagged mountains. There’s the father, Kristian (played by the unassuming, yet charming Kristoffer Joner), his wife, Idun (Ane Dahl Torp), and his two children, Sondre (Jonas Hoff Oftebro) and Julia (Edith Haagenrud-Sande). They’re preparing to move to the coastal city of Stavanger, as Kristian has just accepted a job working for the oil industry there. He must leave behind not just the fjord in Geiranger, but also his much-loved position as a geologist there. Everyone in the family is adjusting to the idea of this impending move. Idun must spend one last night at her job with the hotel in town. Sondre, the angsty teenage son, has to deal with replacing the community he grew up in with somewhere new and foreign. On the other hand, Julia, the youngest of the group, doesn’t completely understand the extent of their move, as she is but a small child. Once Idun gets to her job, the imminence of disaster sets in. 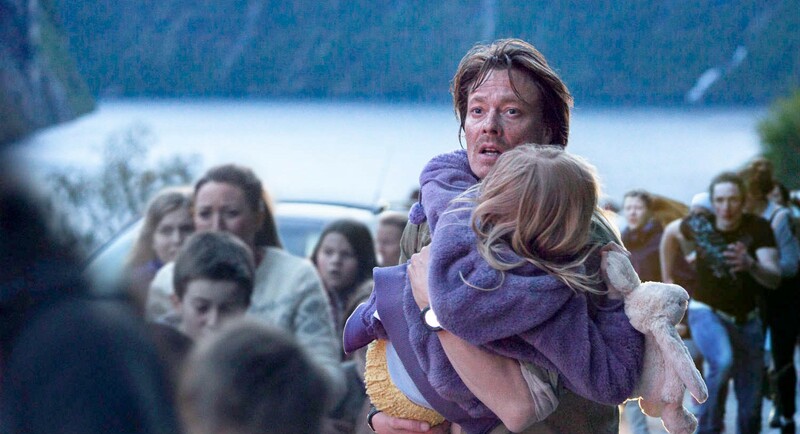 Kristian, instead of bringing his children to the coast, stays in Geiranger for an extra night; he has a hunch that something bad is about to happen based on some iffy data he received his last day on the job. Of course, bad things do indeed ensue. When an entire mountainside collapses, bringing with it a huge tsunami, there are only ten minutes to spare before the entire town is destroyed. Julia is with Kristian at their old house, while Idun and Sondre are staying at the hotel in town. As soon as the countdown to destruction sets in, Kristian knows he must take Julia to higher ground. He successfully gets her to safety, and after being swept into the wave itself (in a very interesting cinematic sequence), Kristian must return to the rubble of the town to try to find his wife and son. Where The Wave fails is not so much in its character building, as the characters in the film are actually quite well-formed. Kristian is a man with many internal conflicts, and it’s easy to sympathize with most of them. He’s just doing what’s best for his family, even if that means moving to a new city and into an apartment with less “soul” than their house in Geiranger. At the same time, however, part of him is attached to his life in Geiranger, as shown when he consistently keeps going back to his work, even after officially quitting. Idun shows her determination and will throughout the course of the film. She’ll do whatever she can to protect and provide for her children, even if that means running directly into danger (that danger coming in the form of a raging, 300-foot tall wave). The thing that peeved me about the script was that it just doesn’t provide much originality. I guess that’s what people expect nowadays going into any disaster film, but that didn’t sit well with me considering the great festival run this film had. When the wave finally does hit at a point halfway through the film, it seemed as if something wholly original was going to happen. I was actually expecting Kristian to die when he gets swept up by the waters, buckled inside a car, frenetically swaying back and forth underwater as the scene fades to black. For once, I hadn’t a clue what the rest of a disaster film would have in store, and I was captivated by the ambiguous prospect. But when Kristian emerged from the wreckage, I was shocked. How could something so preposterous and far-fetched as this get into a script about a realistic scenario? It was almost comical to watch Kristian rise from the rubble and just begin walking away as if nothing had ever happened. Another slight script-related grievance of mine had to do with the archetypal categories that the central characters fell into. Kristian is painted as a “mad scientist” sort of guy, wearing the same schlumpy, wrinkled clothes day after day, never taking his eyes away from his data-filled computer screen. Meanwhile, Sondre fits the overused role of the sullen teenage boy who skateboards and listens to alternative music, a portion of hair perpetually flopping in his face. While the characters’ struggles were certainly original, their actual depictions were disappointingly stereotypical. The other two notable aspects of The Wave — its directing and cinematography — were excellent. This is why I feel that the film was so well reviewed at festivals. Director Roar Uthaug knows how to emotionally pull in his audience by providing many engrossing close-ups and reaction shots. When the characters are framed in this way, it becomes so much easier not just to see their emotions visually, but to also experience those emotions with them. John Christian Rosenlund, the cinematographer, utilizes natural light, while also taking risks by providing a lot of smoke and other effects with which to artistically frame the actors. Rosenlund also captivates in another grand manner: by layering the film with a wide variety of shots detailing the beautiful Norwegian landscape. This allows the viewer to feel not just for the characters, but also for the environment and its natural degradation over the course of the film. The visual effects are quite realistic whenever they are employed, and because the effects weren’t constantly present (such as in a Michael Bay film), their few appearances are almost refreshing. When the great wave is actually shown, it’s spellbinding. I was most taken by the shots of the wave itself roaring through the valley on its way to the town of Geiranger. Another awe-inspiring shot is that of an entire mountainside collapsing into the sea. You can see every undulation of the earth and every loose rock crashing into the water below. The execution of these effects is not to be missed. If you’re a fan of the disaster genre and you have some spare time on your hands, The Wave won’t disappoint. However, if you go in expecting something a little more innovative from it, you won’t be entirely satisfied.